In healthcare, time is of the essence, especially when it comes to a patient’s well-being. That’s why Lua’s focused on supplying healthcare teams with the features they need to reach one another in a timely and secure manner. VOIP calling is one of our features that enable real-time coordination amongst teams of providers, simply because we know some discussions are better had over the phone. 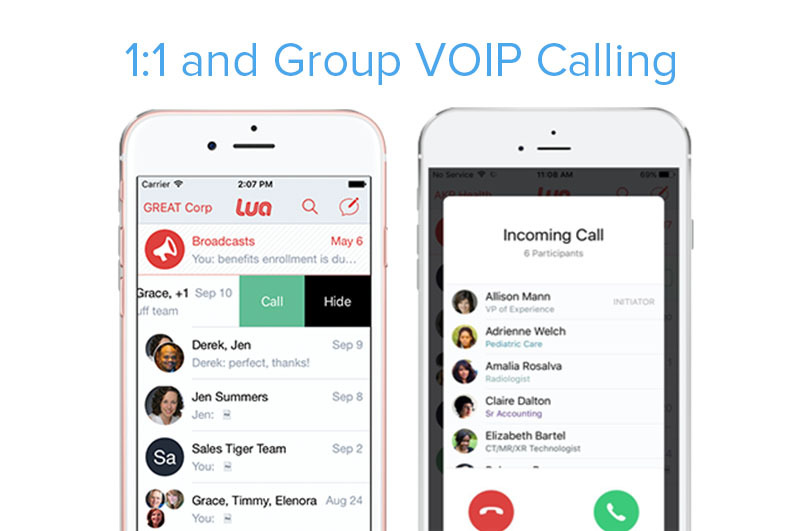 Lua’s VOIP calling makes collaboration easier by allowing users to instantly escalate any messaging conversation into a one-on-one call or group conference call without searching for contact information or phone numbers. Typical conference calls require logins and pin codes. Circulating call information and making sure everyone has the correct time, conference line and logins requires more time. Both impromptu and scheduled conference calls are made easier with Lua. All call participants receive immediate notifications to join the conference call and know exactly which user has initiated the call. Users can also join an ongoing group call at any point once the call has started, eliminating the frustration of missed calls. Calling can be made through your cellular or VOIP and comes standard with the Lua solution. One major plus is that VOIP users don't even need a phone number and can place calls in cellular dead zones (with WiFi). You can make unlimited calls from anywhere, including internationally, making Lua more cost-effective. Get in touch quickly and never miss a discussion. Learn more about voice calling and download the Calling Brief. Ready to improve collaboration and increase efficiency? Request a trial for your team, at no cost.